It definitely took me a while to get on the overnight oats train. I would see recipes all over blogs, but the idea of eating cold oats just did not sound appealing to me. Reluctantly, I decided to give it a shot and I’m so glad that I did. 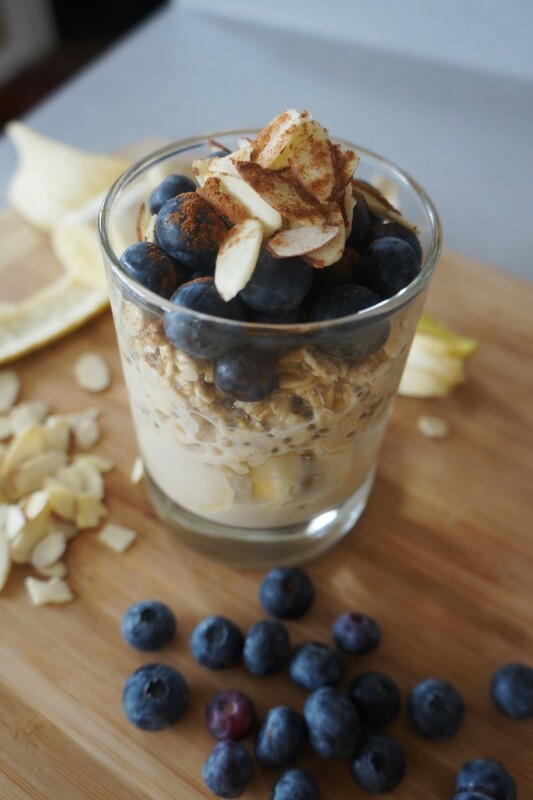 These Blueberry Almond Overnight Oats are one of the easiest, simplest, healthiest breakfasts for rushed weekday mornings. Most of the prep is done the night before and all you need to do before you eat is assemble the oats. It does not require any cooking AT ALL. I like to make the oats in a lock-top container and then in the morning I add my toppings and go. I absolutely love the combination of fresh blueberries and almonds. Blueberries are still in season, and you only need a small amount of slivered almonds per serving. A small bag could easily top oats all week. A dash of pure maple syrup and a ripe banana add just the right amount of sweetness to this breakfast. I used gluten free oats, but regular oats would work fine in this recipe too. 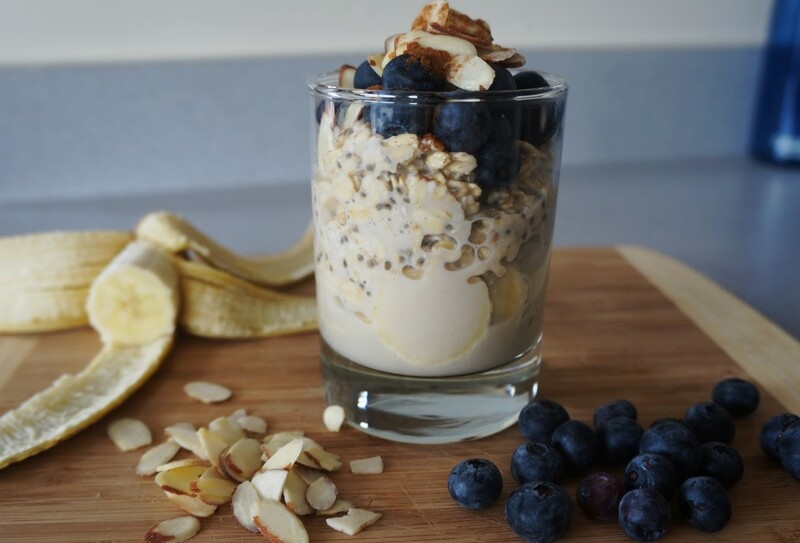 If you haven’t tried overnight oats yet-definitely give this recipe a shot! I think you will be pleasantly surprised with how amazing it is! If you’re not into blueberries and almonds, you could truly use any fruit/nut combinations you prefer. In an airtight container, mix oats, almond milk, chia seeds, maple syrup, and vanilla. Seal the container and place in the fridge overnight. 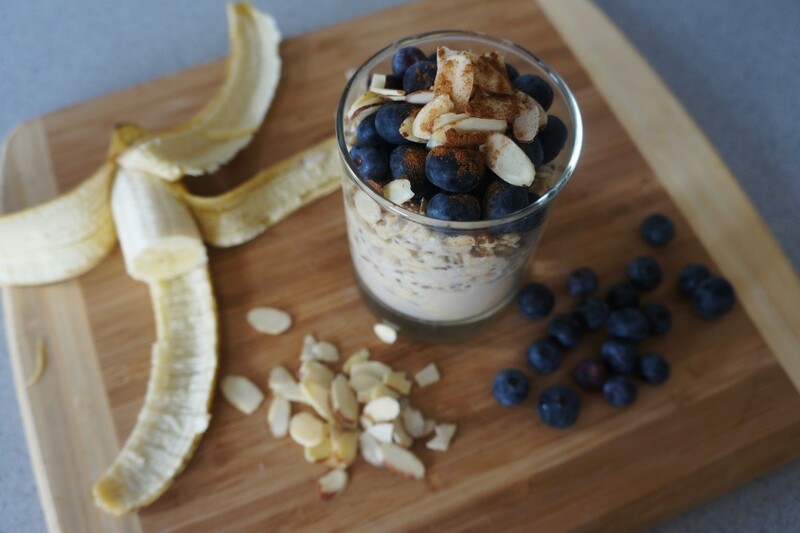 In the morning, stir oats and top with slivered almonds, sliced banana, and blueberries. Enjoy! By vanilla, do you mean vanilla extract? 1 tbs seems like a lot of that stuff! Yes, I do mean vanilla extract…but no I did not mean 1 tablespoon! Thanks for catching! It should read “1 TEAspoon” – I edited the post to reflect the change! You’re right- 1 tbsp is definitely a lot! I’ve recently come across your blog and Instagram, and I love your recipes! I made this one up last night and tried it for my breakfast this morning – it was absolutely delicious and kept me going until lunch. Plus super convenient for busy mornings! Next up: your soup recipe from yesterday! I am thinking this recipe is using rolled oats instead of steel cut since its not really cooking? I am student intern wellness coordinator at People Corporation. 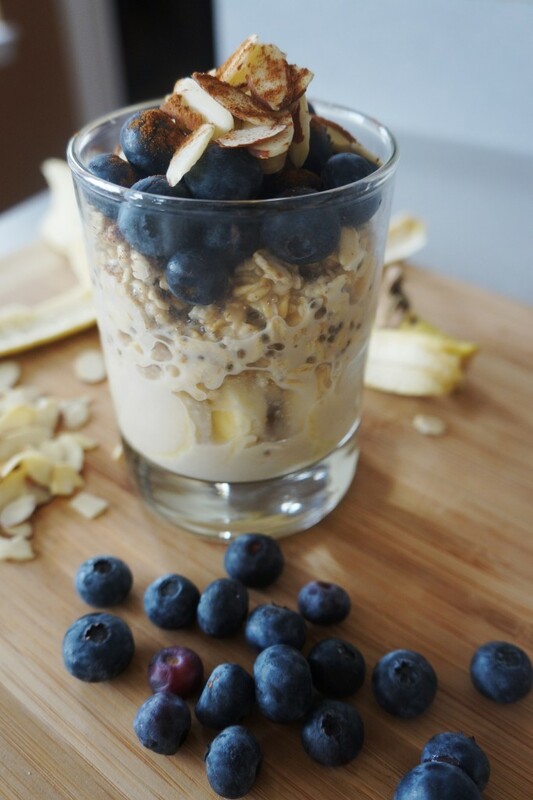 I came across your blueberry almond overnight oats recipe on your blog. I would love to use this recipe for this mostly wellness email we send out to our internal staff. I was wondering if you can grant me permission on using this recipe in our upcoming month’s recipe of the month email. It would be greatly appreciated. Hello! You absolutely have my permission. Thank you for asking! Hi Dana! I like to make a double batch and keep it in the fridge to eat 2 days in a row. I haven’t tried freezing it so I can’t say if it would work or not-if you try it I would love to know! Cholesterol is actually only found in foods that come from animals so this doesn’t have any at all! My concern is the fat content of 9 grams. Can you suggest modifications to lower the fat in this recipe ? Was wondering if I can heat this up in a microwave in the morning, in case I want something warm for breakfast? Thanks! Yes- you can absolutely heat it up f you’d like! If I want something warm, I just heat it in the microwave for a bit. Hi. I am not the biggest fan of blueberries but would love to try this recipe. What other fruit do you think would be just as good? Raspberries or strawberries maybe? Yes, either one (or a combination of both) would work great! Would it be possible to eliminate the syrup to lessen the sugar content or will it just not be the same? Thanks! LOVE this recipe! You can definitely lessen or eliminate it if you prefer! It won’t be very sweet but if you don’t mind that, it will otherwise be fine! Thanks for commenting 🙂 – let me know how it works! Why couldn’t you mix the fruit and almonds in the night before? Then just grab and go in the morning? IThen you don’t have to do all the cutting and mixing in the morning. But cold sounds good to me I have always let my oatmeal cool off. I will try this as mornings are always a race. You can absolutely mix them in the night before if that works better for you! I just don’t prefer to because the bananas get a little too mushy for my taste when they sit in with the oats overnight. Is this suppose to be very liquid ? It will be liquidy when you first mix it together, but after sitting overnight in the fridge the oats will soak up most of the liquid. I made this last night and just had it for breakfast. Sooo delicious! I didn’t add the syrup, because I prefer less sweet. I was trying to find healthy breakfasts on the go, and this is perfect! Thank you for the recipe! Can you add protein powder to this? You can! You might want to add a liiiittle extra almond milk, though so it doesn’t get too dry. Do you have to cook the oat? Hey, Christina! Thanks for the recipe. Wondering if you’ve ever tried using frozen blueberries? My only concern is it might make it a bit too liquidy in the am. I haven’t tried it. You could try it and try reducing the almond milk by a few tablespoons. Or thaw them and pour the liquid off before mixing into the oats. If you try it- let me know how it works! Hello! When you say 1/3 cup oats, how big is your “cup”, like how many millilites (ml)? it would be about 40 g.
I actually DO have a short commute (10-15 minutes), so I haven’t noticed them browning in that amount of time. If you are worried about browning I would cut up the banana and stir them in well so they aren’t sitting on top exposed to the air. Hopefully that would help! I haven’t used steel cut oats- but you can give it a try! I don’t see why it wouldn’t work. Hey, thanks for this recipe. Can you use frozen blueberries in it? This look delicious. Could I use regular milk instead of the Almond milk? I am very into trying this recipe, especially on mornings I go to the gym early in the morning. I see that the recipe calls for Almond Milk. Can Skim Milk be used instead? Also can I used instant rolled oats, or should I buy that non-instant oats? Sorry for taking so long to reply to this– you can absolutely use skim milk and instant oats should also work fine! I just spent the afternoon with my dietitian, her first request was for me to start eating breakfast. I never seem to have time. Well I hit my pc when I got home and typed in healthy breakfast and you popped up! This oatmeal breakfast, along with many of your other recipes look perfect! I am so excited to jump in and eat healthy! Thanks for sharing and wish me luck! Good luck!! I’m sure you will do great!